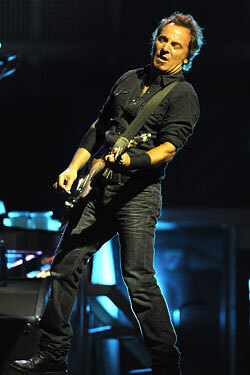 Bruce Springsteen and Mickey Rourke both left last night’s Golden Globes winners, but the prize-winning song, “The Wrestler” (a bonus track on Bruce’s new album), pulls no piledrivers evoking Rourke’s washed-up wrestler character: Over velvety piano and acoustic guitar, the Boss offers up, in an appropriately road-weary voice, a “one-trick pony,” a “one-legged dog,” and “a scarecrow filled with nothing but dust and wheat.” Ouch! “I always leave with less than I had before,” the narrator concludes. But hey, at least there’s that trophy, right?